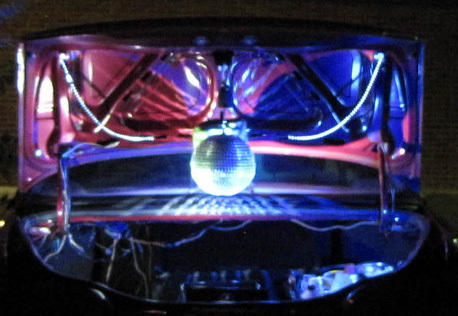 This is a website detailing the exploits of the Disco Trunk! trunk of my classic 1994 Ford Taurus. The rest, as they say, is history! The Decentralized Dance Party came to Pittsburgh. Of course the Disco Trunk was there! It was a blast! Disco Trunk rocked the pre-game party scene at this past Sunday's night game. get them next time! Thanks to all those who donated! The Disco Trunk, being a classic car, is not without it's problems, namely a leakly head gasket. we'll drive around rocking people wherever you want to go!